Since first introduced in 1983, the Chinese Panda Silver Bullion Coin from the China Mint of the People’s Republic of China has undergone many changes. This is owing to many factors including the annually changing reverse designs as well as composition changes. The coins first appeared the year after the China Mint introduced the similar Chinese Panda Gold Bullion Coin. These silver coins expanded on the popularity experienced for those gold strikes and offered collectors and investors a more affordable option into the Panda coin market. 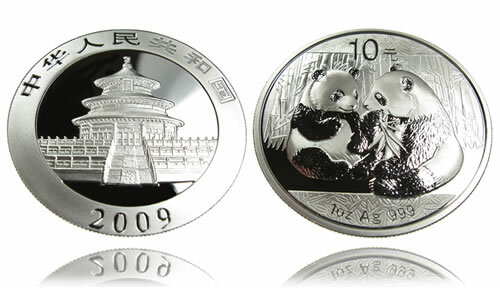 Just like the gold strikes, the silver coins also have experienced annually changing reverse designs based on the iconic creature of China, the panda. Shown on the obverse of each coin is an image of the "Tian Tan," or Temple of Heaven, which is located in Beijing. Typically, the China Mint does not strike a mintmark on any of their Pandas despite the fact that they may have been struck at several different locations over the years. However, it is possible to discern the minting location of some strikes based on subtle differences. An example of this is the font size used on the 1996 Silver Pandas. Anyone interested in creating a complete set of the Chinese Panda Silver Bullion Coins will want to do a fair amount of research to insure the accuracy of their set. That is because the China Mint has produced the Panda Coin with very different specifications over the years. When launched, the Ounce Silver Panda was struck from 90% silver and featured a diameter of 38.6mm. The following year (1984), the coins contained a composition of 92.5% silver before dropping to 90% again in 1985. Finally, beginning in 1987 they settled upon the standard 99.9% silver that is still used today. Diameters have also been standardized and have remained at 40mm for at least two decades. Additional varieties to look for include proof coins, uncirculated coins, gilded coins, colorized coins, etc.